Ride time: 2 - 3 hrs. A Full-Day MTB tour that delivers double the downhill, double the fun! Getting an early start, we’ll shuttle up from Cusco or The Sacred Valley to the Málaga Pass, at 4,350 m (14,272 ft.) and 45 min. from Ollantaytambo, where the world-renown Downhill MTB Race Inca Avalanche and trail festival gets its start. The DH Race is a mass-start frenzy of a bike race that sends hundreds of mountain bikers rolling down the mountain in utter chaos! This technical route offers a bit of everything: bomber verticals, drops, gaps, ramps, wall-rides, and fast, fluid sections (Note: there are ways around all extreme features of the trail). After we finish the first run at 2,635 m (8,645 ft.) – yea, that’s some serious vertical loss! – we’ll enjoy a trailside lunch and then shuttle back up for a second, more aggressive run! 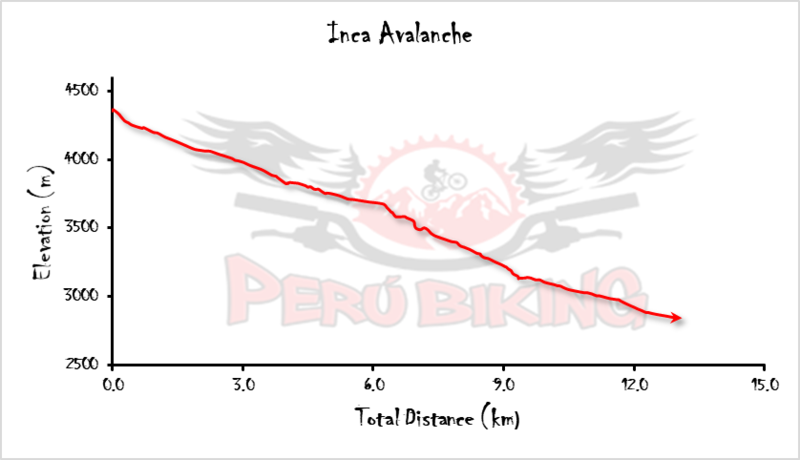 The Inca Avalanche trail ends near the town of Ollantaytambo. From there, our shuttle returns to Cusco at the end of the day. But if you have plans to visit Machu Picchu, the Ruins of Ollantaytambo, or to travel on to Quillabamba in the Peruvian jungle, you might choose to remain in Ollantaytambo. Hey, we’re flexible. We’re happy to help arrange lodging in either Cusco or Ollantaytambo or to assist in planning your visit to Machu Picchu. Just ask!